Representing Faculty Members and Librarians at UMass Boston Since 1976. Please help us get a better salary increase by signing the petition to the Governor below. A fuller update for bargaining will come soon. ►Bargaining update: We have received a very low verbal offer for salary increases for the next 3 years: 1% in January 2018, 2% in January 2019, and 2% in January 2020, with an extra 1% in August 2018 if the state meets revenue targets of $27 billion. Welcome back (and a welcome to UMass for any new NTT faculty)! We know you are busy with the start of the semester but we want to be sure you are aware of important language in the FSU contract regarding non-tenure track faculty. This language covers everything from just cause rights, to promotional eligibility, to paid sick leave, and more. 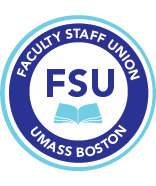 Executive Committee meetings are open to all FSU members in good standing (see the FSU bylaws for more information; see here for more information on the Executive Committee).